So you guys, do we still like all things buffalo sauce?? I mean, I know I still do, but I sort of feel like the whole “buffalo everything” trend has faded. Is this true? Is hot Buffalo Sauce, well… not so hot?? My family is still hard-core buffalo sauce people. I say buffalo sauce because we really do not even need the chicken, we just need the sauce. For us, it’s all about the sauce. Put it on fries, put it on quinoa…twice…third time’s a charm, toss it with shrimp, corn chowder, make a BLT with it, Thanksgiving stuffing? Sure why not. 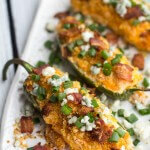 Make a salad, mushrooms + blue cheese guac, buffalo chicken poppers and even some buffalo fried goat cheese. Whoa. I didn’t even realize I had that many buffalo recipes. Promise that I will not bombard you with many more… for a least the next month or so. After that all bets are off. 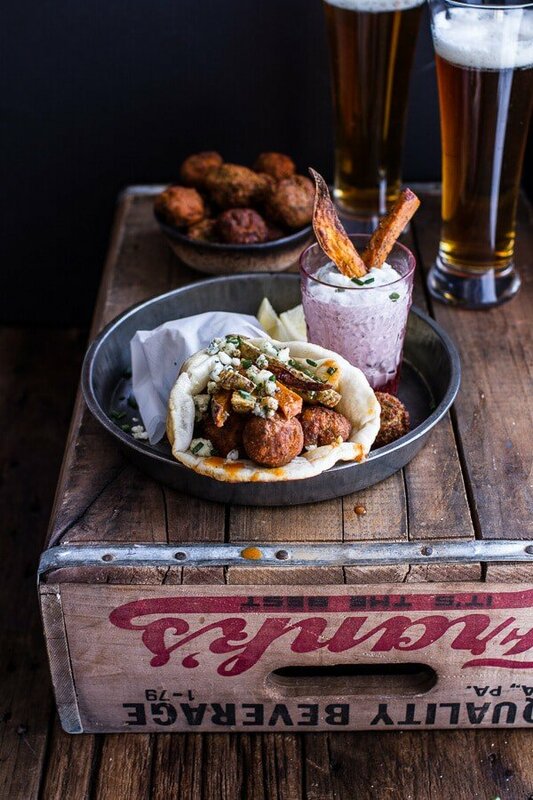 With today being the start of Monday Night Football I thought these Buffalo Falafel Pitas would be kind of perfect. See, this is how I do guy food the “girly” way. And you guys, don’t tell my oldest brother Creighton (yes, the one who was home for a while after he broke his neck but is now back at work in Cleveland), but I totally got all of my remaining brothers to eat this falafel. I told them they were buffalo chicken balls and they believed me… until they bit into them and realized they were minus the chicken. BUT by some miracle, they didn’t ask what exactly they were. They just liked the taste and at that point, that was all that mattered. SCORE!! FYI, if Creighton IS reading this, you should know he is probably dying and in horror that my brothers ate beans instead of chicken… willingly. He is also probably texting us all (meaning me, my immediate family AND my cousins and uncle) in our Group Me app. This also means, that my whole family is probably getting a laugh. Well, except my brothers who ate the falafel. Yeah, they are probably scrubbing their tongues right now to rid themselves of the “health food”. Anyway, this is totally guy food turned chick food, BUT – it’s still completely guy food. Meaning it’s perfect for everyone. The first time I cooked this meal, I fried the falafel because it was my first time making falafel and I really wanted us all to like it. We did, actually, my dad is now calling this his favorite meal, but he really loves anything with buffalo sauce. The second time I made these, I baked the falafel and they still turned out awesome. Not gonna lie though, the fried falafel was just a tad better. Fried pretty much always wins, but I totally get it if you do not want to go to the trouble or want to make this healthier. The baked falafel are still delicious! And the fries. Oh my gosh, the fries are addicting. 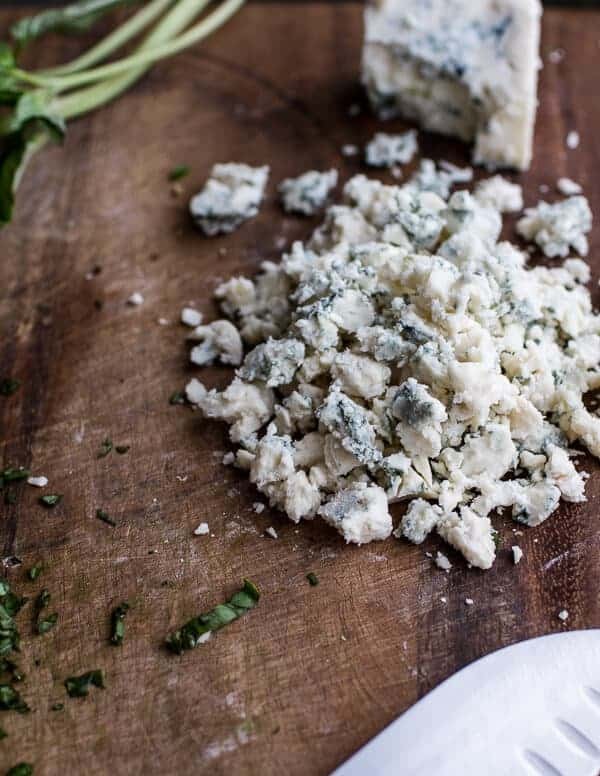 If you despise blue cheese (it’s my favorite), swap sharp shredded cheddar. Either way, you will love these fries. I used a mix of sweet potatoes and regular potatoes, but use whatever your prefer. Also, the tzatziki ranch, it’s not a must, but it just finishes everything off. 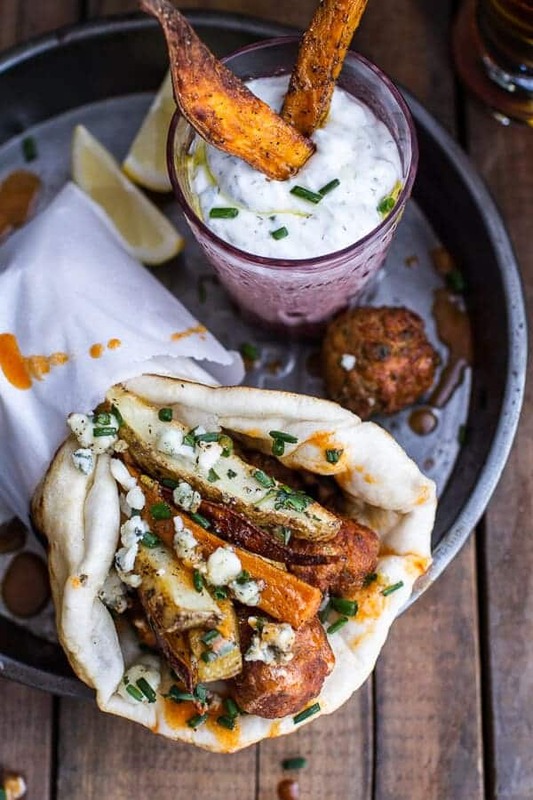 If you ask me, you can’t leave a good pita hanging without a little tzatziki. Total freak. But hey, I just like good food. 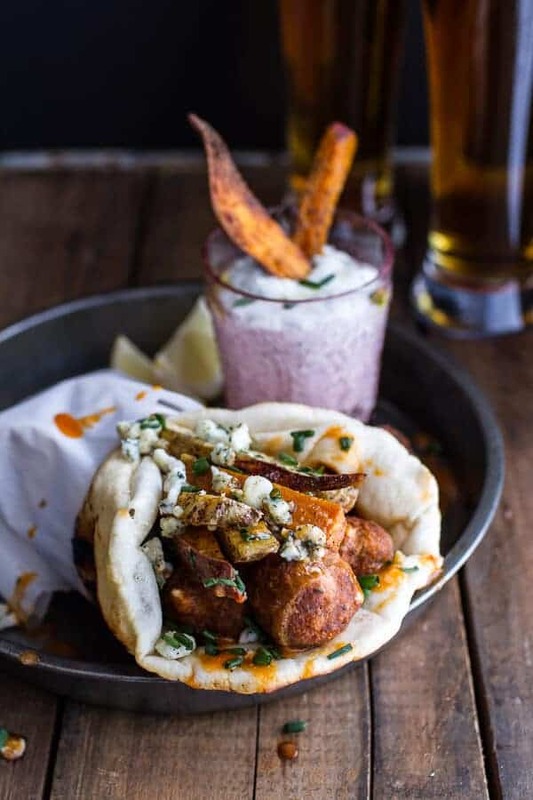 Buffalo Falafel and Garlic Blue Cheese Fry Pita’s w/Ranch Style Tzatziki. Add the ranch dressing, greek yogurt, apple cider vinegar, dried oregano, lemon juice and olive oil to a bowl. Mix until combined and then stir in the cucumber. Store, covered in the fridge until ready to serve. Place cut potatoes in a large bowl and drizzle with oil, garlic, parsley or basil, salt and pepper. Gently toss with your hands or two spatulas to evenly coat. Spread on a baking sheet in one layer. Bake for 15-20 minutes, then flip and bake for 15-20 minutes more. You want the potatoes to be crispy, but not burnt. If you want perfectly crisp fries I recommend spreading the potatoes onto a greased wire rack on top of a baking sheet and baking them as directed above. But this way is a bit of a pain. 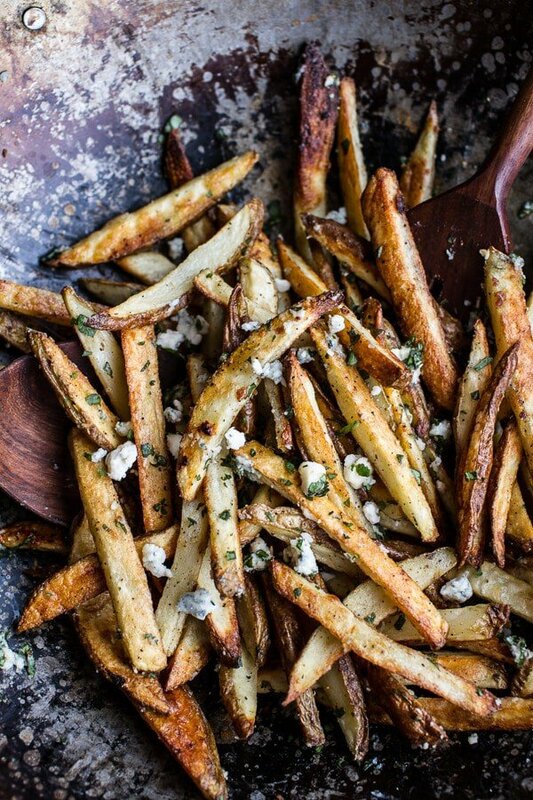 Once the fries are cooked, remove them from the oven and toss with the blue cheese and fresh chopped basil. While the fries are baking, prepare the falafel. 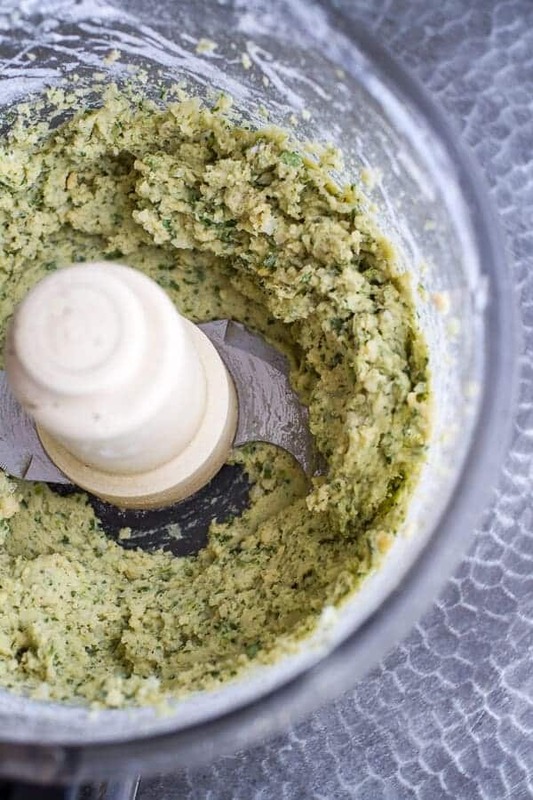 In a food processor, combine the chickpeas, garlic, onions, olive oil, flour, baking powder, cumin, salt and pepper. Puree until smooth. Add the cilantro and pulse a few times. Once the mixture is combined, scoop out about 1-2 tablespoons worth and form into small balls. Place the falafel on a baking sheet (if baking) or a plate (if frying). To bake the falafel, preheat the oven to 400 degrees F.
Bake on a greased cookie sheet for about 20 minutes or until crisp on top and cooked through. Remove from the oven and gently toss with buffalo sauce. Return the falafel to the cookie sheet and bake 5 minutes longer. To fry the falafel, add a few inches of oil to the bottom of a heavy pot. Heat to 375 degrees F.
Fry the balls for 2-3 minutes or until golden and cooked through. Drain on paper towels and then immediately toss with buffalo sauce. To serve place the falafel on a warm pita. Top with fries and drizzle with extra buffalo sauce, blue cheese and green onions. 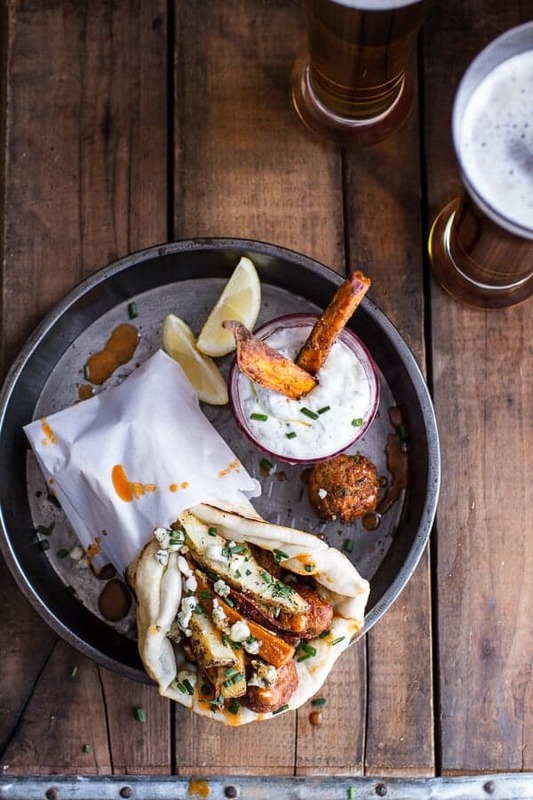 Wrap up and serve with the Ranch style Tzatziki. 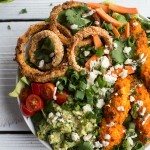 **To make your own buffalo sauce melt 1 stick - 8 tablespoons - unsalted butter (you can also use half olive oil, half butter or you can simply reduce the butter to 4 tablespoons). Add 1/2 cup of Franks Red Hot Sauce, 1 teaspoon of seasoned salt and 1/2 teaspoon pepper. Mix well. And clearly this is good food. Seriously guys. I love buffalo sauce! This is such a great twist to a falafel! These look amazing! Do you have a recieps for your own pitta? Thank Andy!! Here is the link to my pita bread recipe. I make it all the time!! 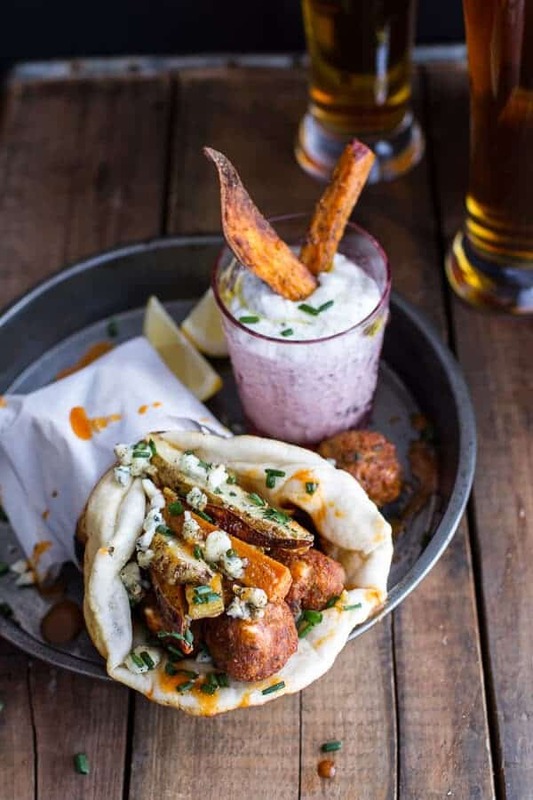 Falafels are my favorite..luy them.. but with that buffalo sauce I think I can now convince my husband to eat them…and those fries so good. These are so great! Frank’s buffalo sauce is the only buffalo sauce in our house. We love it. I just tried falafel for the first time and was really impressed. Can’t wait to make these. your food always looks simply scrumptious and I believe I would try every recipe I’ve seen so far. Yum! Awe! Thanks Katie!! Hope you had a great Monday…or as good as monday can get that is! My family still buffalo sauces everything. All my brothers would eat growing up was buffalo chicken tenders. Love this dish! I love falafel! This is definitely an amazing way to kick it up a notch! Im straight from Buffalo and this looks awesome! How can you argue about anything with Franks. And by the way your recipe is spot on for the sauce. Just how its made at Frank and Teresas Anchor Bar the birth of the chicken wing. Yes please! This looks so good Tieghan! I sent you a message on Instagram about your summer curry dish with coconut rice – in the recipe you state to add the coconut milk in with the rice, but then don’t mention how much to add into the actually chicken curry dish – just wondering! Oops! So sorry I will fix that now and sorry I did not see your instagram message too! Thanks Katya! Hope you had a great monday! I love this twist on falafel, killer flavors! I LOVE buffalo sauce! Always and forever! 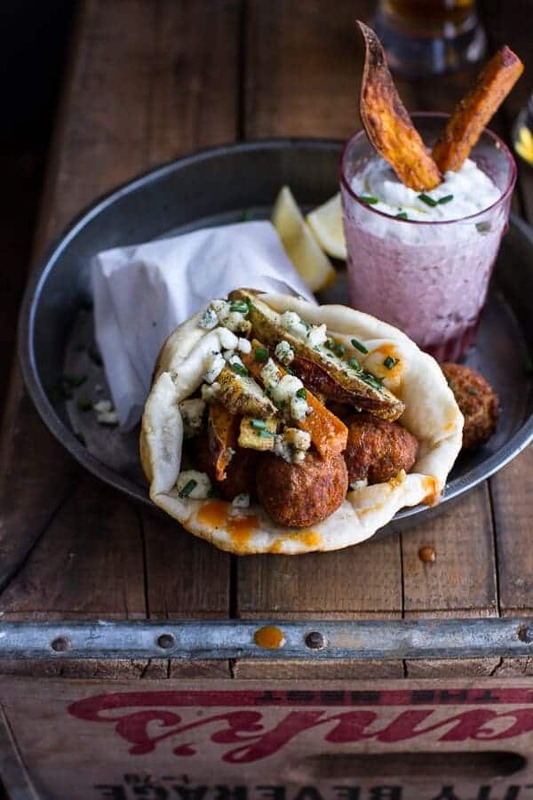 these falafel look soooo freaking good and with all that toppings – i die. Good thing I am typing and not speaking because I have a serious case of mouth drooling! I still love all things buffalo sauce 🙂 Especially these pitas!! 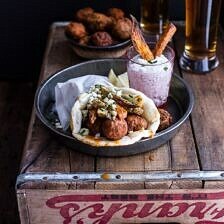 Also, that ranch tzatziki is calling ma name. Ya!! Thanks so much, Brandon! Yeah for buffalo sauce! Thanks Karen! Wow… this is so much fun. I LOVE falafel, and anything with ranch dressing. Once again, an inspired combination, Tieghan 🙂 Thanks! I love all of this. And I’m def not tired of the buffalo sauce! Oh my, now this is a sandwich. Oh my word!!! Your blog is pretty much the greatest find of my life!! Your food is beautiful and amazing!!! Thank you! Your food styling is impeccable! And this wrap is out of this world! Blue cheese and yogurt are not vegan, not sure why this is under that catagory. You can make bomb falafel without yucky animal curds btw!! Hey Ashley, I did not chill mine and it turned out great, but if you are worried about it, chilling will not harm it. Hope you enjoy this! I am brand new to deep frying anything and my falafel desinigrated in the hot oil. Do you have any idea why this wouldve happened? Thankfully I had enough left over to toss in the oven, but my hungry hubs and babe are waiting very patiently for dinner! Oh man!! I have no idea why that would happen. Was the falafel a soil ball when you fried it?? So sorry for the trouble. Hope i can help! If you want really crispy oven fries, try soaking the potato strips in water for about 20 minutes. Drain them, dry them off a bit, and then bake. Soaking them takes out some of the starch. If you want to get really crazy – after you drain and dry them, pour on a little buffalo wing sauce, toss them in it, and then bake them. Can I substitute with a gluten free flour? Thanks! 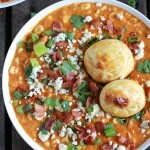 How many ounces of chickpeas in the recipe? Wow! yummy! I will try this. 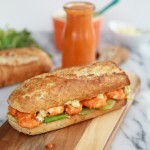 You can add one more mouth watering recipe in your blog that i tried last Sunday “Crispy Fish Finger”. Thank you! I hope you love this Andy!